OtherHand, I met you on 12/18/2010. I was the hiker who came back up to look for the 2 hikers who went down the wrong ridge. The immediate descent to the east from Quail mountain heads down a face before splitting into two ridges. It is very easy to drop down the wrong one if you aren't acutely paying attention. In Bill's case, there's a lot of questions. 1) He seemingly was set on going to Carey's castle. Based on time of the morning phone calls he made and his arrival to Juniper after 10am, did he have a chance to go in between? If not, why did he change his mind? 2) How confident are you that the bandana's is definitely his? In your comments, you don't think he made it to the top of Quail. Combining those two, are you confident that he took the route from Juniper to the bandana, but then veered north / west instead of turning northeast toward the summit? 3) What's the potential error in the 10.6 mile ping radius? Is 10.6 miles the predicted distance the ping came from, or the maximum distance? There isn't much searching inside the ring - makes sense to search outside it given where he started, but that's a lot of area left. 1. In the narrative, the rangers who checked out the trailhead for Carey's said it didn't look like anyone had been there for weeks. Bill's fiancee thought that's where he was headed because it was first on his list and she asked him not to. She had Googled Carey's and wasn't comfortable with him going solo there. Bill's late arrival is odd, and doesn't match well with his cell calls. He should have been at the trailhead a little after 9 AM but wasn't there until at least after 10:30. But we don't know if he stopped along the way. That's a REAL late start for Quail. 2. I'm not confident the bandanna's Bills at all. I just don't know. His fiancee is more inclined to think it is. She said he often used one (he was balding) and would sometimes leave it to mark a trail junction for return. The location this was found wasn't any sort of decision point I can see, but it is on the direct route up the Quail face. I don't think he made it to the top of Quail since he never signed the register (I know, not conclusive) but if anything had occurred to cause him to descend other than by the way he came, there's stellar cell coverage on Quail. Also, if you're on Quail you AREN'T going to get lost. You can see everywhere. 4. I was told the error in the 10.6 mile radius was about 10%. The estimate was the actual distance, not a maximum. But without knowing more how Verizon measures distance in the case of the Serin tower, it's hard to say more about it. For example, I think (but am not sure) it's done on the basis of signal strength in this particular case. If that's so, would a phone in a backpack appear further from the tower (due to the lesser signal strength) than one held in the hand? These are the sort of questions I'd like to ask Verizon. Zé wrote: 2) How confident are you that the bandana's is definitely his? Even if it was, it could have blown away from him and someone else messed with it. Did you see this map? OtherHand wrote: 4. I was told the error in the 10.6 mile radius was about 10%. The estimate was the actual distance, not a maximum. But without knowing more how Verizon measures distance in the case of the Serin tower, it's hard to say more about it. For example, I think (but am not sure) it's done on the basis of signal strength in this particular case. If that's so, would a phone in a backpack appear further from the tower (due to the lesser signal strength) than one held in the hand? These are the sort of questions I'd like to ask Verizon. That does seem to be the standard protocol, from what I've just quickly looked up. The +10% error would allow about another mile outward, but even still that radius is solidly northwest of the peak by about a mile. And that's probably a good maximum distance approximation, since any attenuation of the signal due to terrain would mean he's actually closer to the tower. Looking at the location of the bandanna (was the bandanna found soon or long after he was reported missing?) 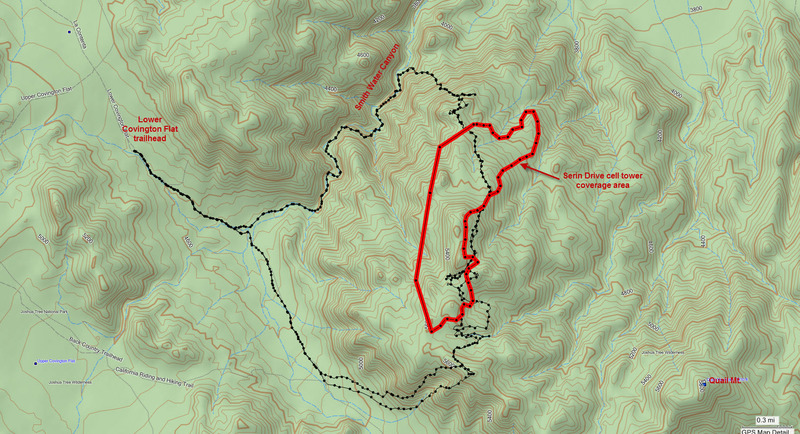 relative to the routes up Quail, is it possible that he mistook the 5787' bump as Quail mtn? How would that alter his choices after? Maybe he was considering taking an alternate route back. I wonder where he got his trail route information. HPS has 4 different routes, including one from the Covington Flat area. That routes describes getting up to the 5640' ridge southwest of 5787'...I'm not sure how well that area was tracked. I'm sure most of this has been considered already, but throwing it out there. The bandanna was found late Sunday morning (Bill did his hike on Thursday), so it's unlikely anyone messed with it or it was blown any distance. Winds weren't that heavy those days. The thing about the SE face of Quail is that it's pretty open. I've been up the drainage the bandanna was found at the base of, and the Riverside Sheriff's helicopter spent considerable time just hovering across that face. Bill's not there. Once you're at the peak, there are two obvious ways back to the Juniper Flats trailhead. One is right down the face onto Juniper Flats, then the trail back. The other is to descend the sort of southeasterly ridge. which drops you on the east side of Juniper Flats. From there it's a straight line, cross country back to the trailhead. It's a shorter route, distance wise. That's where we initially thought he'd be (excepting the cell phone data) and focused our initial searches there. It's not like Bill was planning a long hike. He wanted to be out of the park by 5 PM and at Pappy & Harriet's. I wonder where he got his trail route information. I do notice on satellite photos that there is a fairly clear track extending beyond the end of the road in Juniper Flats. Zoom in to one less than max (max is a little blurry) on that link, and you can follow the track where it joins a wash, and then if you follow the wash you can see where a track jumps out of the wash around point "P" (a common thing for a trail that follows a wash when an obstacle is encountered). The route can be traced all the way up to point "S" on the summit ridge. Interestingly, the point at which the bandana was found appears to be close to the track that I've plotted on the above linked map. The track I've plotted would get him to the summit ridge. Perhaps he became injured somewhere along in here and made a decision to try to get to the nearest road head (Lower Covington Flat). I don't have anything of course that would prove that, but something made him go away from his vehicle and away from his objective. So, for whatever reason he heads toward the nearest roadhead. From the top, based on OtherHand's comments, it may not look so bad to cut NW from the summit ridge. Looking at the topo, if he were somewhere near point "A" on Quail Mtn's summit ridge and wanted to go to the Lower Covington roadhead, he might head through points "B" and "C", thus avoiding having to climb the ridge immediately south of point "B." To get on the Sierra Club HPS route, he'd have to turn SW (recall that he wants to go NW to get to the road head) and go through points "D", "E," and "F". But he may not have known of the HPS route and may not have had a detailed topo of that area if Quail were his objective. Instead, he proceeds NW and winds up on the ridge described by points "G" through "K". The ridge itself doesn't look too bad, but somehow he has to go west to get to the Calif. Riding & Hiking Trail which will lead him to the road head. Therein lies the rub. The terrain to the west of the ridge described by points "G" through "K" is very steep. Perhaps he got stranded somewhere in here? I note that there don't appear to be a lot of search tracks going through that terrain to the west of the above described ridge (although clearly there are some). Dunno. Just an idea. Just trying to piece things together. EDIT: Interestingly, the cell phone coverage area comes very close to point "J" on the above map link. The area bounded by the search track from JT32 might be an interesting area to look at exit routes to the west from the ridge I described. Hikin_Jim wrote: So, for whatever reason he heads toward the nearest roadhead. From the top, based on OtherHand's comments, it may not look so bad to cut NW from the summit ridge. Here's a real crappy iPhone panorama done at the high point at 34.0080, -116.2658 taken on JT32. It will give you a feel for the terrain and how open it is. It's on the ridge you're talking about. That ridge has been gone over pretty well by the initial searchers and us losers. It's also very open. A couple of things about it. First is a question of why you'd want to stay on the undulating ridge when you can see the trail on the apparently valley floor just to your left? Second is that you could hit a lot of cell phone towers other than the Serin tower. It's a pretty good view. So if he was diverting, there would; have already been an issue, and he could have made a cell call. This is the sort of stuff that makes sense when looking at a map, but when you actually get onsite, you go," Uh....no". I can't tell you how many times I've done the same thing, and it doesn't resolve until actually getting to the spot and looking around. OTOH, there have been some times when it all felt absolutely perfect and I thought Bill could be around the next rock. Your thought about him heading for the nearest roadhead has been a working theory of mine for a while. The trick is coming up with a destination and route that keeps him out of all cell phone coverage until early Sunday morning. As I said, it's a good mystery. Every spot that remotely makes sense has been checked. All that's left are the crazy places, and it's hard to narrow them down. Yeah, there's only so much you can do with a two dimensional map. I read about your Norman Cox search and how you had to revise things once you got on the ground. Completely understood. The only reason I can think of him not dropping down off that undulating ridge is that he was severely injured. Perhaps he was looking for a viable route down? He went missing on Thursday. The ping was detected on Sunday. That's three days later. Three days and he's just made it to within 10.6 miles of the tower? He's moving at a crawl, perhaps literally. You and I might just say "bite the bullet; let's get down to that trail." A person severely injured may not have that option. An easy route down perhaps was a necessity not a "nice to have." It looks pretty steep to the left (west) of that ridge show in your photo. so there was only one ping, from the start of his hiking on Thursday until the ping on Sunday?